Successful info picket at CBC Hamilton! 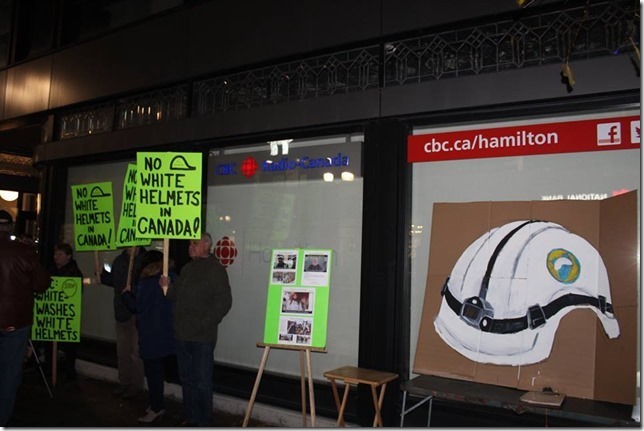 In what we believe was the first such protest in Canada over Trudeau’s resettlement in this country of 117 White Helmets and the CBC’s sanitizing these terrorist collaborators as “humanitarian heroes”, our Coalition mounted a very successful informational picket at CBC Hamilton last night. Our display included a giant painting of a white helmet, a person posing in White Helmet costume in front of a laptop displaying – on a loop – a Mint Press video exposing the propagandistic nature of that organization, an info board showing the deep ties between the White Helmets and Al Qaeda, some picket signs, and leaflets. Our leafletters received a warm and interested response from many of the passers-by who were attending the monthly Art Crawl on James Street North in Hamilton. Many stopped to talk and ask questions. 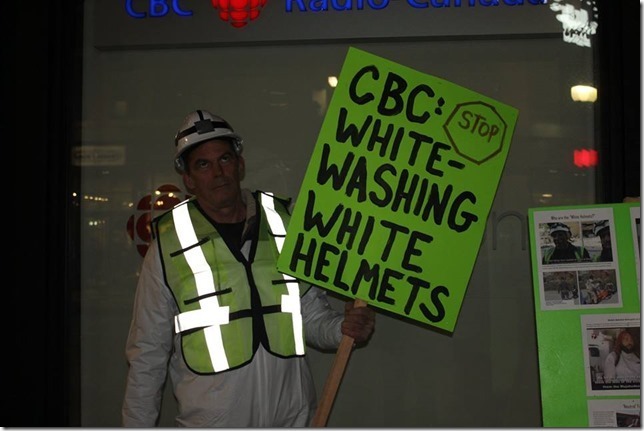 Many of them had not even heard of the White Helmets previously, much less of the $7.5 m dollars of our tax dollars which the Trudeau government has given the group to promote Canada’s regime change operation in Syria. We would like to thank all of our exec. members who joined the picket and worked very hard to prepare the display, the signs, and leaflets. Thanks also to Mark Taliano for speaking at the event and taking these photos. Not surprisingly, the CBC chose not to cover the event which took place right in front of their windows.